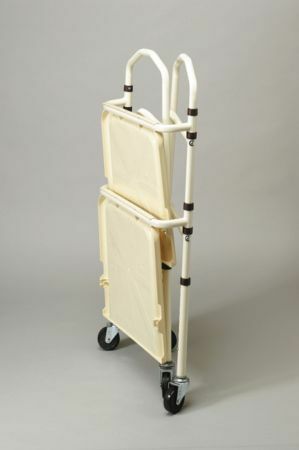 Folding Trolley Walker With Easy Grip Handles. Made to a very high standard, the Walsall Folding Trolley walker has a sturdy steel frame, and conveniently sized moulded plastic trays. It's a piece of cake to collapse and fold this walker trolley, so it is particularly suitable in smaller homes, or places where space is at a premium. This item can be used to move hot meals, drinks or other items between rooms in the house, and its handles will provide improved grip and stability to those who need it. The four large castors make the walker easy to control and position - no matter whether the floor is carpeted or tiled. The handles are height adjustable making this suitable for all sizes. painful to do my bit. My thoughts echo Allan Shearer's. Until a few months ago I could walk with one stick, but cooking and kitchen chores were difficult with only one free hand, painful, and could be dangerous. 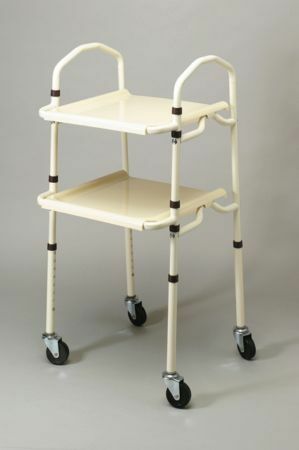 Now the time has come when I really need two sticks or a two-handed walking aid, and this trolley fits the bill perfectly, steady enough to lean on and with plenty of shelf space. A bonus is that is easily folds flat and can be tucked out of the way if need be. It has my heartiest recommendation.